The Steel Oyster case measures 40mm and features an 18ct Gold screw down crown and chrono buttons and is water resistant 100 meters. It has a Self winding movement. The white dial features baton hour indices, with chronograph function. 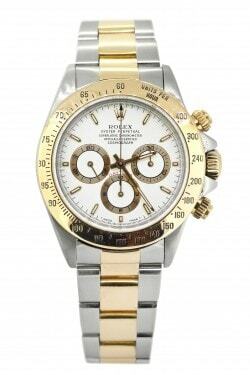 The watch has a steel and gold Rolex Oyster bracelet with folding clasp. It comes complete with box and instruction booklets but no chronometer paperwork.